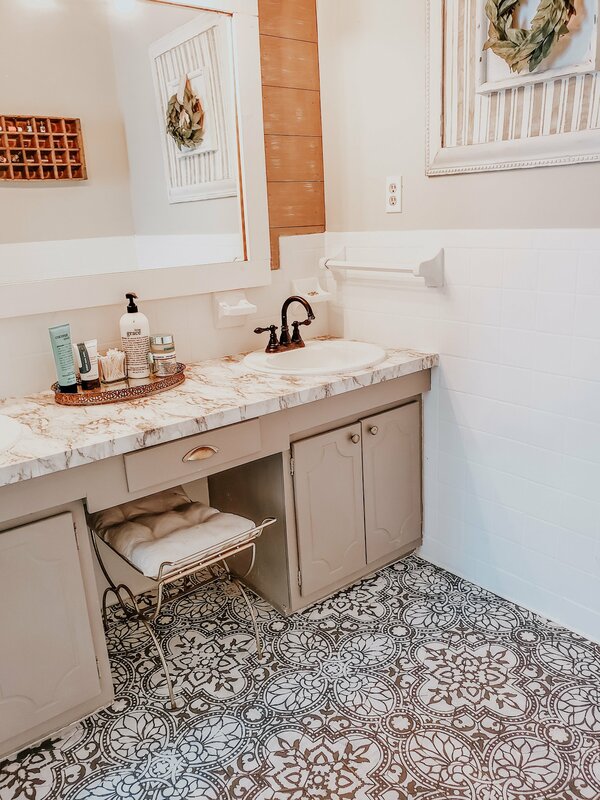 A while ago I was browsing through Instagram as per usual and I saw a friend’s floors in her master bathroom and it stopped me in my tracks. I fell in love with them! They were stunning. Of course I had to know what she had done and how she did it because I was ready to do whatever it took to make my floors that way. I saw she used a company called Cutting Edge Stencils and I was intrigued. I checked them out and fell in love with all of their stencils. I reached out to them and they were so generous and sent me the gorgeous Alatera stencil and a brush kit. If you are interested in browsing these beautiful stencils, click HERE to see all that Cutting Edge stencils has to offer! These stencils are so easy to use, durable and reuseable which I love. The quality is excellent and I love how they work. Each stencil is made so it is easy to line up with the stencil you just did. It was very very easy to get every stencil lined up and ready to paint because of this feature. And because of this the floors look seamless! If you saw my post about how I painted our floors you know that it was a huge transformation from what was originally here. Thank you 1970’s style for my blue and white hexagon tile floor! So I painted the floors. You can see the full tutorial HERE. So since the floors were already painted, all I had to do was use the stencil and use white paint to get the look I wanted. I kept the dark gray as the background color and chose white for the stenciled part. First thing I did was clean clean clean my floors. I swept and swept some more. Then cleaned them down super good. Once it was all dry, I was able to start tackling the project. I started at the furthest part of the room from the door. I put the stencil down as level as I could and used some tape to keep it in place. I had my paint poured and roller ready to go. I got just a little bit of paint on my roller and wiped off the excess on a paper towel. I started to roll slowly and gently until I had finished that stencil. I moved on and on to each new spot but in between I made sure I blotted the excess paint on the stencil with a clean paper towel. This took me a few hours each night and when I was done I made sure to rinse the stencil off completely and lightly scrub the paint off of it. Be careful to do it as gently as possible as you don’t want to ruin your stencil. It was a bit difficult to get into all of the nooks and crannies of the bathroom but I did the best I could and made sure if I couldn’t get to a spot I came back the next day when it was dry and could re try it again. I had to free hand some because I did not want to cut my stencil. But of course feel free to do whatever you want when you do this project! Once it is all painted and dried you want to make sure your floors are swept up and you are ready to seal them! Also make sure to do any touchups before you seal them. My biggest advice is don’t go too crazy on touch ups. It is never going to be perfect. Stand up and look down at yourfloor then decide what needs to be touched up. I ended up doing 4 coats of Polycrylic and I chose the Satin finish because it is what I had and it gave it a super pretty sheen. Make sure to let the polycrylic dry at least 2 hours in betwwen coats. When applying the polycrylic make sure to do thin coats. Definitely don’t go heavy on this step! That is it!!!! It is all finished at this point and you will have some gorgeous new floors to stare at. It is so rewarding doing this and SO worth the time it took to stencil it all. Please share pictures with me if you end up doing this. I would love to see what you do!